ANS Performance enters the protein market with N-Pro, delivering high quality protein. 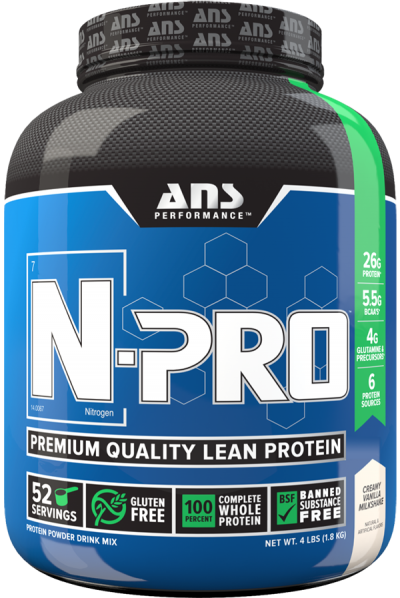 Not to be outdone by the competition, ANS Performance brings their first ever protein to the market with N-Pro. So far in 2015, we’ve seen a host of new and unique protein powders hit the market like MusclePharm’s Whey Diesel and MuscleTech’s Micellar Whey. If you know anything about ANS, you know they are synonymous with quality, innovation, and great taste. In crafting their pre-workouts, Dilate and Ritual, they spared no expense and utilized only the best forms of ingredients. The same rings true for N-Pro. ANS uses cross-flow, cold-pressed microfiltration (CMF) protein, yielding a superior quality protein with incredibly high biological value. Enough with the pleasantries though, let’s take a look at the ingredient profile and see what N-Pro brings to the party! N-Pro uses 6 different types of protein to start muscle protein synthesis and keep it going for several hours. N-Pro utilizes a “Multi-Phase Time Release Protein Complex” comprised of 6 types of protein taking care of your protein needs both in the immediate post-workout window and several hours later to keep those anabolic pathways active. We’re rewarded with 26g of high quality protein in each and every scoop to accelerate our gains! Post-workout is the optimal time to get some quick digesting protein in your system. You’ve just spent the past hour (or more) breaking down your muscles, and need to start the repair process immediately.For this exact reason, ANS includes whey protein concentrate (WPC 80), whey protein isolate, and hydrolyzed whey protein. These three proteins are rapidly digested by the body, so your muscles get an immediate of amino acids to start the rebuilding process. Side note here, we’re very pleased to see ANS list the exact content of their whey protein concentrate (WPC 80) as opposed to plain on WPC on the label. For those not aware, whey protein concentrates can range anywhere from 35-80% protein by weight. N-Pro’s WPC 80 means that 80% of their concentrate is pure protein goodness with minimal fat and carbs. When other brands just list WPC on the label, you have no idea the protein content of that particular concentrate. Let’s say you just finished your workout and it’s going to be several hours until you are eating dinner. N-Pro took this into account by including Milk Protein Isolate and Egg White Albumin in their Intermediate Absorption blend.Milk Protein is a combination of whey and casein proteins, giving it a digestion rate somewhere between the lightning quick rate of whey and the slow-burning rate of casein. Eggs have long been known to yield the highest biological value of any protein we can eat. Egg whites contain all of the high quality protein that eggs have to offer without the excess of calories from fat that are contained in the yolk. The combination of these two protein sources yield a slower digesting rates than whey, and will tide you over until it’s chow time! N-Pro’s Multi-Phase Time Release Protein complex keeps you anabolic for up to 8 hours! How many times have you downed a protein shake right after your last set of squats and then realize several hours later, you’re starving! This is because most protein powders on the market don’t incorporate any slow digesting proteins into their blends, they either sell whey powders or casein powders. ANS solves this quandary by including micellar casein in N-Pro. Have a few calories left over at the end of the day and need a quick snack before bedtime? Thanks to the inclusion of micellar casein in the Time Release Protein Complex, you won’t have to worry about going catabolic overnight! Typical of all other protein powders on the market, N-Pro contains the usual assortment of natural and artificial flavorings, artificial sweeteners (you do want your protein to taste good don’t you? ), and a blend of various gums to help with texture and mouthfeel.Finally, ANS included Bromelain and Lactase in their Digestive Enzyme Blend to help out those individuals that may have problems digesting whey and casein proteins in the past. 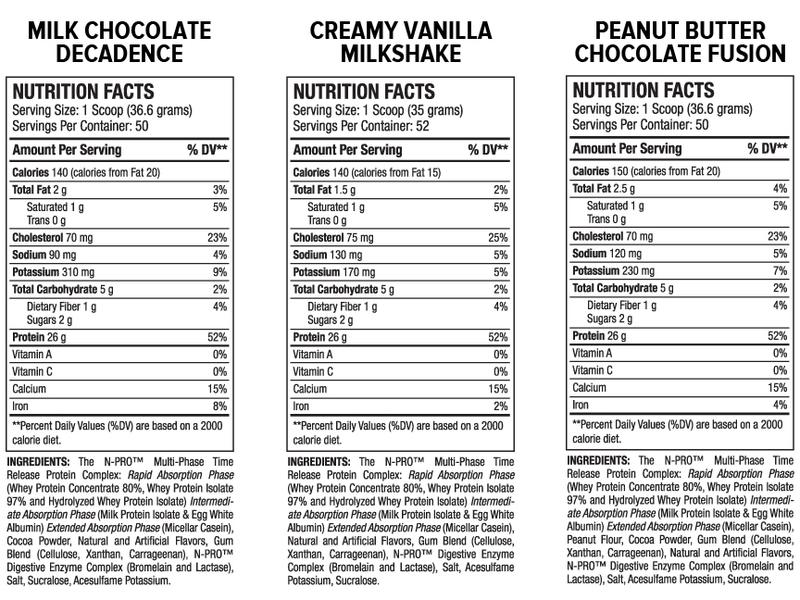 That’s it for the ingredients, but let’s look at the macro distribution awaiting us in each scoop of N-Pro! Now, we know what you’re thinking, “none of those are exciting or revolutionary flavors,” but we’ve all experienced our fair share of poorly flavored proteins before. So, if ANS delivers with N-Pro just like it has all its other supplements, you won’t be disappointed – but time will tell as we get down to reviewing it! After that, we hope that this will definitely make a few appearances for various types of users on our Protein Powder Buyer’s Guide. It currently is only available in 4-lb tubs and retails for $59.99 on their website. Head over to our ANS Performance page and click monitor this brand. This will get you new product release info as well as price drop alerts on all ANS products. Bookmark this page, as we’ll just slowly update this post as more information comes available. No Comments | Posted in New Products, Supplement News | Tagged ANS Performance, Milk Protein Isolate, Protein, Protein Powder, Whey Protein, Whey Protein Concentrate, Whey Protein Isolate.